A United Launch Alliance Delta 4 rocket blasts off from Space Launch Complex-6 at 4:12 p.m. PDT with the classified NROL-25 national security satellite for the National Reconnaissance Office. An unmanned rocket blasted off from the California coast Tuesday (April 3) carrying a clandestine new spy satellite for the U.S. military. 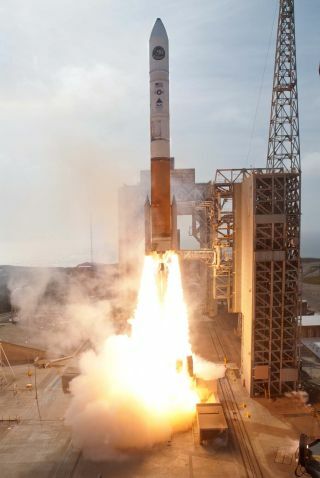 The United Launch Alliance Delta 4 rocket launched from Vandenberg Air Force Base at 4:12 p.m. PDT (2312 GMT) on a mission to orbit the classified satellite, called NROL-25, for the U.S. National Reconnaissance Office. The liftoff came after several delays due to bad weather and a technical glitch. "Congratulations to the NRO and to all the mission partners involved in this critical national security launch," said Jim Sponnick, vice president of mission operation for ULA, which oversaw the launch. "ULA is proud to have supported this mission and delivered critical capabilities to the men and women defending our freedom throughout the world." "Our ability to sustain such high tempo is due both to the diligent efforts of our program teams who successfully acquire and deliver these complex systems on time, and our strong partnerships with the Air Force launch community," said Betty Sapp, NRO deputy principal director, before the launch during testimony before a House Armed Services Committee subcommittee on March 8. "These successful launches are a very important and visible reminder of the space reconnaissance mission the NRO started over 50 years ago, and continues with such great success today." A United Launch Alliance Delta 4 rocket soars into orbit from Space Launch Complex-6 at Vandenberg Air Force Base in California at 4:12 p.m. PDT Tuesday, April 3, 2012. The rocket carried the NROL-25 spy satellite for the National Reconnaissance Office. Because of the secretive nature of the NROL-25 mission, ULA officials cut off a live webcast of the launch 3.5 minutes after liftoff. The flight did, however, mark a milestone for the Delta 4 rocket; it was the first to launch using a version of the booster called the Delta 4 Medium-plus 5,2 configuration, which uses a common Delta 4 core flanked by twin solid rocket boosters and topped with a 5-meter fairing to cover the satellite payload. The next ULA launch is slated to blast off in early May, when the launch provider will oversee a mission to loft the new communications satellite for the U.S. Air Force from the Cape Canaveral Air Force Station in Florida.